As a child I sewed by hand (age 8), my father worked in a place that had satin and taffeta scraps and he brought them home. As I grew up, age 9, I got a tin toy sewing machine with a crank handle. I was in heaven I could sew tube tops for me and things for my dolls. 12 years old when I got a real sewing machine WOW. Did I wonder where the sewing machine came from? No – and had not really thought about it until thinking about a post for RCC. A sewing machine is: “a machine used to stitch fabric and other materials together with thread.” These machines were invented during the Industrial Revolution to decrease the amount of time it took to hand sew garments. In 1755, Charles Frederick Wiesenthal, a German born engineer living in the UK was issued the first British patent for a mechanical device to aid in the art of sewing. The machine consisted of a double-pointed needle with an eye on one end. In 1790, the English inventor Thomas Saint invented the first sewing machine design, but he did not market the machine well. The machine was designed to sew canvas and leather type materials. It is thought that Saint had a working model but it has never been found. The machine produced a chain stitch method (a vertical needle bar and a looper), the single thread made a simple stitch in the material and with the aid of the stitching awl which pierced the material going to the underside forming a stitch – the process was repeated and formed a locked stitch. This machine was also used to make saddles, bridles, canvas and boat sails. His machine was very advance but needed steady improvements over the next decades. In 1874 William N. Wilson found Saints British patent in the patent office. Wilson made adjustments to the looper and built a working machine – the machine is in the London Science Museum. In 1804 a sewing machine was built by Englishman Thomas and James Henderson, an embroidering machine was built by John Duncan in Scotland, Austrian tailor, Josef Madersperger began developing his first machine in 1807, his first working model was in 1814. You could go on and on through the years but to be up to date we shall skip a few of the years. 1845 brought an important improvement “the needle running away from the point, starting from the eye”. there have been patent infringements and awards made this machine. Singer then designed a better one using a falling shuttle instead of the rotary plus he included a presser foot to hold the fabric in place – the needle was placed vertically, had a fixed arm to hold the needle and provided a basic tension system Singer was granted a patent in 1851 and suggested a patent for a foot petal (called a treadle) but this foot petal had been in use for too long to get a patent. With the invention of the Sewing Machine a mans shirt could be produced in 1 hour where by hand it took 14.5 hours. 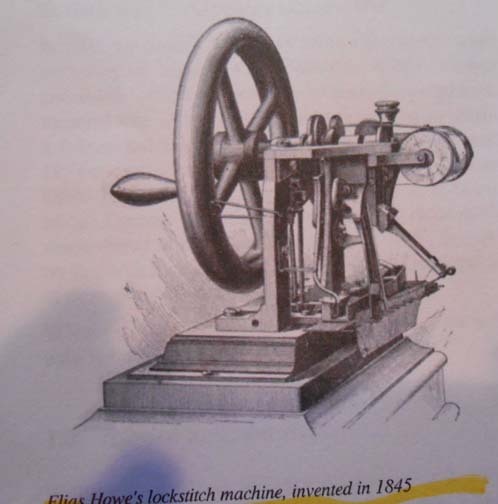 Since 1877 many types of machines have been designed i.e. overlock, crochet, vibrating shuttle . 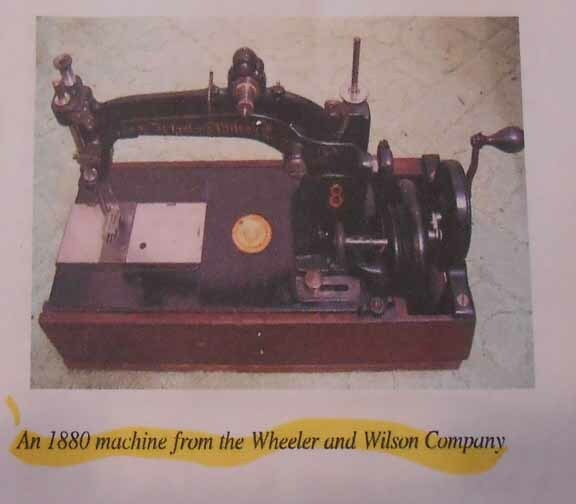 In 1880 this machine was built by the Wilson and Wheeler Company. Notice the crank. As the years evolved so did the sewing machine industry – Making a selection as to what you need or want – are you going to quilt on it, sew garments, make sails, overlock., embroidery, felt or ??? What size throat, domestic or longarm, it goes on and on. Then comes price. A big new Bernina would be fun but do you need a new car? The first BIG Bernina cost $12,000.00 , a Ford Focus cost $11,000.00. Looking back over the years what have been your machines, what type of sewing have you done? I have a 1-year-old Jamone 8900 Horizon, the first computerized machine I’ve owned. My all time favorite is my 30-year-old 930 Bernina. I do wall art quilts, wearable art and streetwear. I too have a Bernina 930, which will have to be pried from my cold, dead fingers! Been through one motor already. I just bought a 1230 that is a bit newer at an estate sale the other day…. I couldn’t just leave it SITTING there all alone and lost, well could I? I also have a Juki TL98Q with a big harp, a singer featherweight and a singer with a hand crank. And a Singer Serger. Thought I’d died and gone to heaven with all of them. 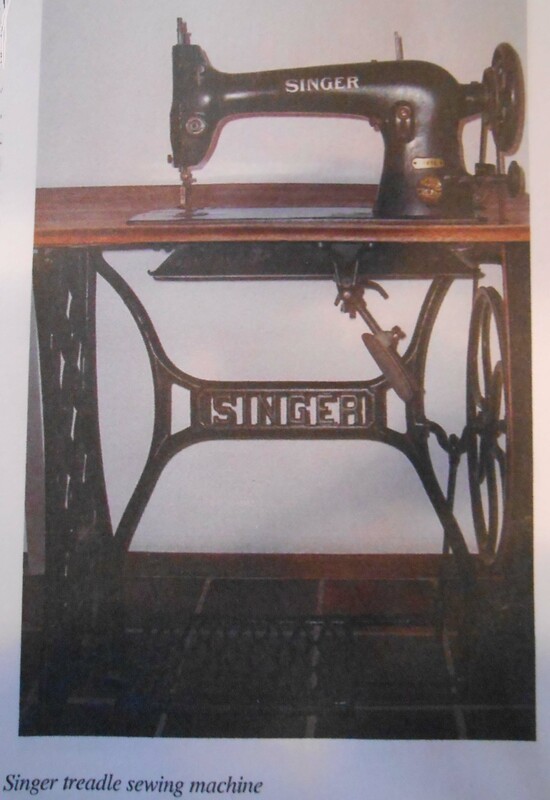 My first machine was a Singer that was given to my aunt for her 18th birthday – she was born in 1913. It had a motor, and knee paddle, and stitch length regulator, but didn’t sew backwards at all. We had various attachments – buttonholes was the important one. All seams were finished be edge-stitching … how I longed for a zigzag machine! Well, thinking of the machines I’ve used over the years is a pleasant stroll down memory lane. My mother had a Gem straight stitch machine with multiple attachments which I think she was afraid to use, although I still have the costume dress she added tons of ruffles to using the ruffler. It was probably cast iron, very heavy and was powered by a knee paddle. The same knee paddle technology was present on the Singer sewing machines provided in the sewing semester of Home Ec. So that was second nature to me when all of a sudden I had to learn how to operate a Morse with foot pedal that was won in a raffle and presented to me – my first all mine machine. It could zigzag and I think could do some decorative stitching and I sewed most of my own clothes and a lot of my mother’s on that machine. Once married, I moved to the land of Viking sewing machines – they were even in the schools there, and eventually traded in the Morse for one. I know that Viking had cams which I used to play with decorative stitches. It sewed like a dream after the temperamental Morse. But once computerized sewing machines came on the market (mid-80’s? ), I was drooling over their precision, ability to always stop at the top or the bottom of the needle swing and built-in alphabet. The husband took note and without consulting me, traded the old Viking in for the new computerized version. I was still making clothes but starting to piece some quilts as well. I still have that machine which I consider my workhorse for standard stitching. The last progression was to add another Viking better able to handle the free-motion quilting I was now doing. I thought I’d done all my research but failed to note that the harp area was actually a bit smaller than my workhorse Viking that balked at the free-motion stuff. I eventually sold it to a friend who still had one of the old cam Vikings that was on its last legs and purchased a Viking Sapphire with a wider harp area for the quilting. It doesn’t sound the same as my old workhorse and has a lot more plastic parts, but it does have some additional features that make it a pleasure to work with. I’ve found it a bit of a luxery to have two machines, but I do use them for different things and find it reassuring to know I have a backup if one goes to the shop. I don’t foresee having to replace these two or add to them ever – I am very happy and between the two of them, can do all I want. I no longer make clothes, but boy, do I make quilts! I love hearing what your relationship is with your machine. I have always had a great friendship with my Bernina 930 and it will always live in the studio. Had a singer treadle for a while but my daughter wanted it so it now lives at her place. Happy sewing what ever we use. I have 2 sewing machines and a serger. My mother bought me my first sewing machine when I was in High School – a White (I don’t recall the model offhand and I’m not at home right now). Last year, my paternal grandmother died and I inherited her sewing machine – a Heavy Duty Singer. Shortly after my own grandmother died, a friend’s grandmother died as well. As my friend was going through her belongings, he asked me if I would like to have her serger. Because each of my machines does have a personal and sentimental history, I don’t plan on ever getting rid of them. Sandy, I’m afraid that I do not have the emotional tie to my sewing machine that many quiltmakers have. 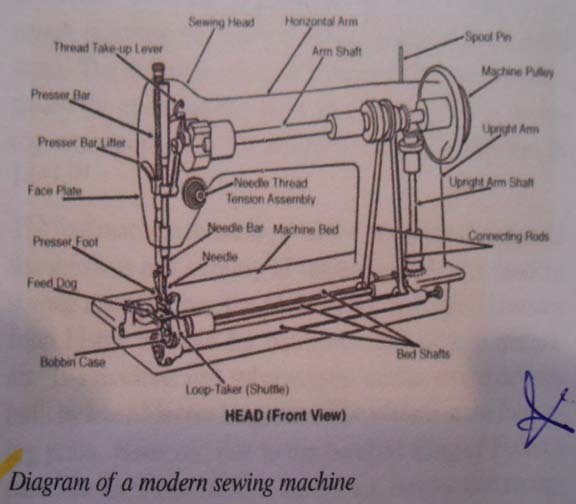 The first machines I knew were the treadle ones owned by my grandmothers. My mother made most of my clothes using a hand cranked machine, even when electric ones were affordable. She was wary of the runaway speed! After she was unable to use it we gave it to a charity which took it to Africa. I never was able to get the hang of my mother in law’s Elna, bought at great expense in the 60s, and which was operated with a knee paddle! My own models – of which there have only been three, one after the other over 45 years – have been straightforwardly foot-operated models. My present Pfaff was a 50th birthday gift some 17 years ago, and is potentially all singing and dancing with digital embroidery attachments, but I underuse it really – it sews a range of mean seams, and that satisfies me. Any fancy stuff I do by hand. Sandy, I have a ridiculous number of sewing machines. Two I inherited: a 1930’s Singer in a table and a Featherweight. I don’t use them, but I’ve enjoyed looking at them. They have sentimental value. They come from my husband’s aunts and mother. I have my mother’s Kenmore, which I used a lot in the past, until I got my Bernina 1090 S in 1990. I love my machine! It has broken down twice in the last 4 years — I became despondent. What would I do without my dear machine? Fortunately only a new motherboard (1st) and a simple cleaning (2nd) were required. I also have a backup Bernina 830. But it doesn’t have needledown, and frankly, I just don’t know it as well. It’s knowing your machine for a long time — like a friendship — that makes it so important.